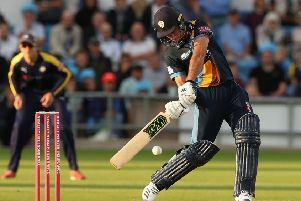 Matt Critchley smashed 22 off the final over from Tim Bresnan to give Derbyshire Falcons a dramatic five-wicket win over Yorkshire Vikings with one ball to spare in the Vitality Blast game at a wet and blustery Chesterfield. The Vikings were favourites going into the last over with the Falcons needing 19 to chase down 167 but Critchley hit two sixes and two fours to pull off a shock victory. Billy Godleman played his part with an an unbeaten 71 and Ravi Rampaul took 4 for 19 to restrict the Vikings to 166 for 8 with David Willey top scoring with 55. Rain had delayed the start by 35 minutes and Tom Kohler-Cadmore took 14 off the first three balls from Wayne Madsen but in the next over, he was brilliantly caught low down at cover by Matt Critchley. After 10 overs, the Vikings were 91 for 2 and Willey launched Ravi Rampaul for a huge six into the trees on his way to a 37 ball 50 but the Falcons made a much-needed breakthrough in the 13th over when Williamson pulled Wahab Riaz to square leg. Gary Ballance carved Riaz over cover for six but Willey miscued to mid off in the same over and Derbyshire’s tight bowling was rewarded when Hughes bowled Ballance. Bresnan drove Hughes for six but Jonathan Tattersall was bowled swinging at Viljoen and after a brief rain break, Bresnan was caught behind pulling Rampaul and Liam Plunkett lost his middle stump to the next ball. The Falcons had done well to restrict The Vikings to 64 off the last nine overs and began the chase by taking 17 from the second over by Bresnan which included a six over long on from Billy Godleman. But Azeem Rafiq had Calum MacLeod caught at deep midwicket in the fourth and in the next over, Madsen was run out for two after a mix-up with Godleman. Anuj Dal ramped Plunkett for six but was lbw in Adil Rashid’s first over and the game was in the balance with the Falcons needing 91 from the last 10. Wilson drove Rashid for six but was stumped advancing at Rafiq in the 13th over and Rashid beat Viljoen’s big swing with the last ball of the 15th.